Druze firefigher Wiam Nevoani jumps into flames to save a Torah scroll from a burning Nahariya synagogue. Druze firefighter Wiam Nevoani saved a Torah scroll from a burning synagogue on Monday, endangering his life. Nevoani, a resident of the Druze village of Julis in northern Israel, told Channel 20 about the experience. 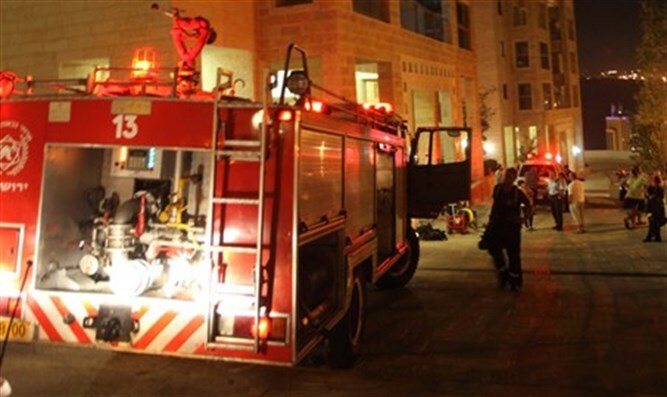 "On Monday we were called to fight a fire in a Nahariya synagogue," Nevoani said. "An initial investigation showed that no one was trapped in the building. We were four teams of firefighters, and as we drove I realized the importance of the site of the fire. I thought about the site's importance and high level of sanctity. Based on the report that we'd received, that no one was trapped, I started thinking about how to save the contents of the building - the Torah scrolls, all the prayer books." "When we arrived at the site, the flames were huge, there was a rain of fire. The temperature reading was very high, and the building was surrounded by smoke. We started working to put out the fire and very quickly got it under control. The team worked very professionally and very efficiently. "As we were working, I identified a Torah scroll, and immediately jumped, grabbed it, and brought it outside. As I brought it outside, I felt like I was holding a soul, like I was saving a person, saving a baby." When asked if he was worried about the risk to his own life, Nevoani said, "The warmth emanating from the Torah scroll touched my heart, and for a few seconds I wondered and thought to myself about what is written in the scroll." Nevoani also doesn't see his actions as remarkable in any way. "At the end of the day, I just did my job. Everyone who becomes a firefighter knows and understands what he's doing and why he's doing it."